Finca Tierra Negra makes small batches of carbon rich soil from green waste and food compost. We're proud to be collecting food scraps from kitchens that stand for Food Justice with our partners: Lasa, Kismet, Cookbook and Triniti. Our mission is to restore real food nutrition to the soil and vitality to our planet. We take an active role to mitigate climate change by sequestering carbon on site practicing biodynamic, regenerative methods of natural farming. Our objective is to come Full Circle, creating high functioning regenerative compost systems for healthy soil, carbon storage, clean water, nutritious food, drought resistance and restored habitats. Blending green waste for soil building is hands down the most nutritious resource we have to work with—especially in Southern California. This is an Eco-System based approach to soil building and regenerative agriculture. "The project is part urban garden, part environmental activism, and part art practice, but the big picture is to take waste, like food scraps and gardening clippings, and transform them into energy through composting." At Finca Tierra Negra, Britt is baking and fermenting food and green waste to build earth through a passive method called Lasagna Composting. Lasagna Composting is the most forgiving and generous of all composts. It burns up all pathogens and seed while keeping the biology alive and thriving. Composting food scraps with layers of our blended green waste converts organic material into stable soil carbon, while retaining water and nutrients of the original waste matter. The result is a healthy inoculum that will bring the biology back into the soil naturally. Lasagna Compost is Living Soil. "It’s a months-long curating process that begins by collecting kitchen scraps from local restaurants and ends with a silky, jet black handful of soil that acts like superfood for your edible garden." Now more than ever, it is paramount and the need is urgent to meet the needs of a society in a country where industrial agriculture has dominated the landscape for the last 40 years, polluting the water and skewing the marketplace, while warming the climate for future generations. The first step towards a better future is always the most difficult. Poet and agrarian philosopher Wendell Berry suggest that, “there is no big solution,” only many small ones, and that we must rebuild the economy from the ground up. Agriculture, with it's unique ability to sequester carbon on, as Carl Sagan might say, billions and billions of acres, is the only indusry poised to reverse global warming. Improved management of cropping and grazing heals the land, boosts soil fertility, prevents flooding, enhances drought resilience, increases the nutritional content of food and restores wildlife habitat­—­while sequestering carbon. Reforestation also plays a key and critical role. Increasing Soil Organic Carbon has two benefits­—as well as helping to mitigate climate change; it acts as a water filtration system and improves soil health. It is the basis of soil fertility. While releasing nutrients for plant growth, it promotes the structure, biological and physical health of soil and acts as a buffer against harmful substances. Carbon sequestration is the long-term storage of carbon in oceans, soils, vegetation (especially forests) and geological formations. Soil Carbon Sequestration is the process of storing carbon in the soil. Dead particulate organic material resulting from the process of aging plants is the number one major source of Soil Organic Carbon. Soil Organic Carbon (SOC) is the amount of carbon stored in the soil, a component of Soil Organic Matter (SOM) which is plant and animal materials in the soil that are at various stages of decay. 1% increase in Soil Organic Matter enables each acre to hold an additional 20,000 gallons of rainfall. 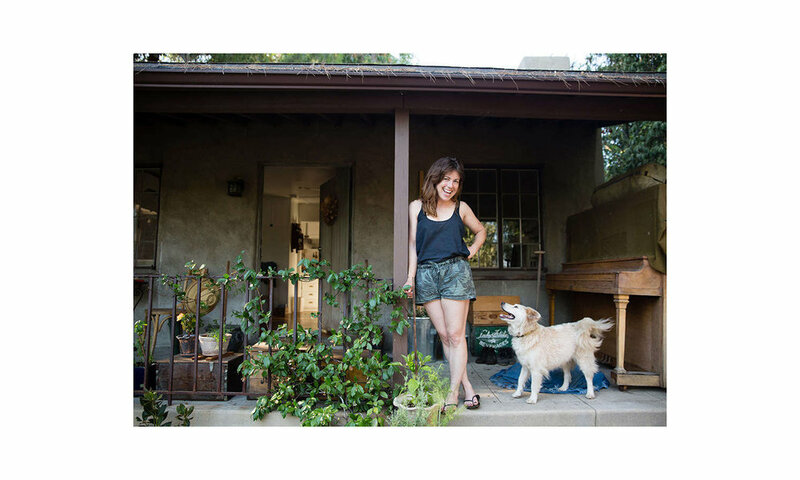 Britt Browne is an interdisciplinary artist and farmer living in Los Angeles. She draws on inspiration from deep-rooted Agrarian traditions around the world and is known to go to extremes for these pursuits, Laura Silverman once wrote, “Britt has a mad case for the blues; she’s in love with indigo.” The author would like to add that she is equally keen on working with the elements; she likes to have a good time. Her attraction to color and process have been detailed before and seen inside The Shelburne Museum, The Standard Hotel, For Your Art, Fellows of Contemporary Art, W Magazine, The Plant Journal and The Hammer Museum. Today you can find her growing old world French lettuces and rare Persian melons, among other things in Los Angeles. Britt practices biodynamic, bio-intensive, natural farming.